Become a Volunteer! 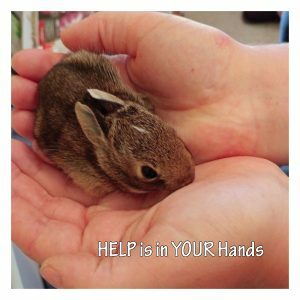 Help is in YOUR Hands! We offer a free three-hour training course and ask volunteers to commit to one four-hour shift per week. Experienced volunteers will work with the new ones in their first shifts to give them guidance. Article in the Bradford Today newspaper about Procyon Wildlife. If you love wild animals big and small, Procyon Wildlife may have your dream volunteering opportunity. 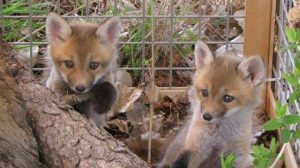 The animal rehabilitation centre currently has more than 200 animals to take care of — from skunks, turtles and chipmunks, to raccoons, fawns and coyotes — on nearly two hectares of land in Beeton. And it is looking for volunteers. “It is baby season. 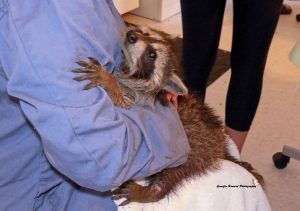 Every spring all the rehab centres are completely full,” said Debra Spilar, Procyon’s director. “If mom is out foraging for food and gets hit by a car (or attacked),” the babies are abandoned. The centre does not take baby birds because it does not have an aviary to help them learn to fly, she said, but it takes all other native species to Ontario. Spilar said the porcupines and skunks are her favourite animals to work with. “They are very mild-mannered and easy going,” she said, adding that is because people and other animals typically avoid them just by their visual warning cues. Animals are kept indoors and outdoors at the centre’s property. Inside, there are several nurseries for baby animals, including a rabbit nursery and a toddler nursery just for raccoons, Spilar said. There is also a sick bay, quarantine area, veterinary examination room, and an education room. Spilar sometimes hosts students at the centre and gives presentations at schools and other community group meetings. Outside at the centre, there are several outdoor cage areas where animals are kept in separate areas while undergoing care. The idea is that the animals brought to the centre start indoors and eventually transition to outdoor cages as they get healthier before being released. Whether injured or abandoned when a parent dies, the animals all arrive at the centre because of the interference of people, Spilar said. The centre is recognized by the Ministry of Natural Resources and Forestry, but it does not receive any funding from it, she said. “Wild animals are always overlooked for funding. The government just does not put it in the budget. We’re currently fighting for it,” she said, adding the centre has no paid employees. That is why having enough volunteers is important. The centre is looking for people to help with all sorts of tasks, from caring for the animals, fundraising and doing site repairs, to cleaning laundry, cutting the grass and writing grants. It accepted volunteers from anywhere. Currently, it has volunteers from around Ontario, including Barrie, Brampton and Pickering. The centre offers a free three-hour training course and asks volunteers to commit to one four-hour shift per week. Experienced volunteers will work with the new ones in their first shifts to give them guidance. Spilar said she hopes more people will get involved with the centre. and ask for an application form. WHEN: June 16, 8 a.m. to 12 p.m.